Hello. Hi. Howdy. Sometimes I miss just coming here and chatting. This month, however, choices must be made, and my choice this month is to devote as much time as possible writing my 50,000 words. That doesn’t always leave time to come here and chit the chat. We are in week four (maybe five, I don’t even know anymore) of at least one child being sick. Coughs and sniffles, broken up occasionally by a sinus infection, strep, or fifth’s disease, have been passed around my household, keeping us all awake for several hours each night. Finally, last night, I was felled by some bizarre combination of headache, sinus pressure, nausea (no, I’m not pregnant, thank you for thinking that) and sore throat. It’s a greatest hits of all my kids’ illnesses for the four weeks (maybe five). So today I wrote 1800 words, which normally I could do in one sitting, but it took me over eight hours today. Eight miserable hours of my own discomfort plus taking care of two littles who are also unwell, but well enough to want such unreasonable items as food, water, and attention. I’m closing in on 50,000 and am in a murky area where I wonder if I’m spinning my wheels, if I’m adding words that add value to the piece. That kind of thinking slows me down. I am enjoying cycling through two or three open pieces at a time. 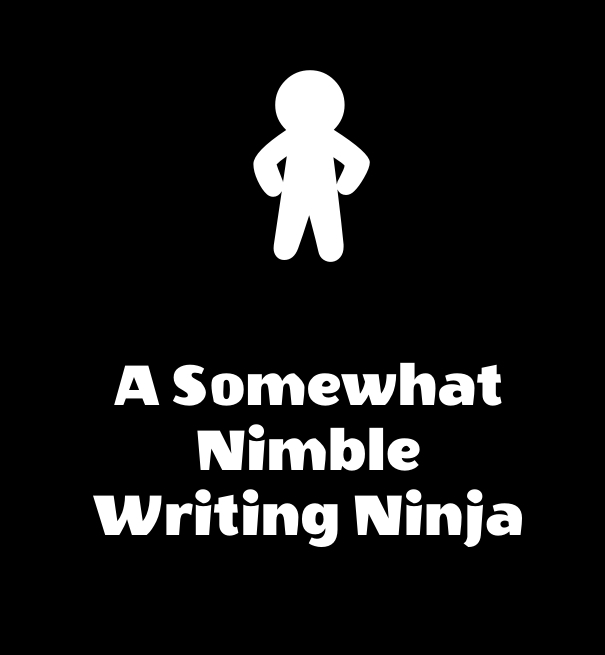 Makes me feel like a Somewhat Nimble Writing Ninja. Or just really unfocused. Sinus-infected. Take your pick. Once I hit 50,000 words, I will resume a more reasonable writing schedule. This past year I was a task master — each day at least an hour and forty minutes editing or the usual 1667 words based on the NaNo model (and something I read somewhere one hour of editing is worth 1000 words.) Making up lost time on weekends or early mornings. I need to rework the model so I’m focusing on trying to finish a certain number of pieces in a certain time frame or looking at a submission deadline and working backwards from there to create a schedule. Or maybe expect only 7000 words/7 hours editing a week (or a combination of the two.) Until next summer, that may be all I can commit. I am relearning that I am happiest when I actually can spend hours writing, and when I’m not trying to “squeeze it in.” That’s the best part of NaNo. The illness? Not so much. Here’s to tea, juice, ibuprofen, and a heating pad.